The wedding day is around the corner and you should be prepared for this memorable day. This preparation includes also a gift together with the greeting card and your warmest congratulations and wedding wishes about a happily married life, to the couple who gets married. No matter if you write a formal or informal message, the most important part is that to be sincere and heartfelt. Describe the past memories you shared with the couple and wish them for happy full of joy married life! Keep in mind that only your wedding wishes will remain unchanged through the years of the couple’s life. Below you can find unique and awesome ideas of Wedding Wishes and Happy Married Life Messages to help you write your own personalized wish for the bride and groom. ♦ Starting your own family is the most precious thing in life. Wishing you the best on your wedding! 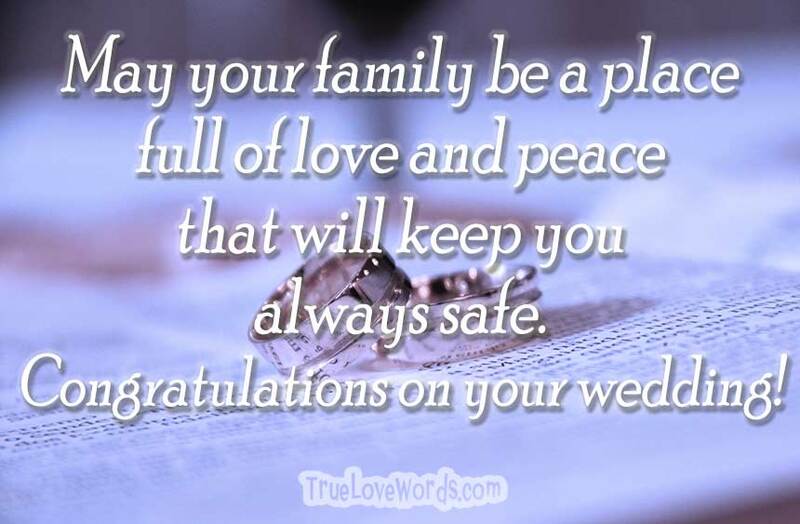 ♦ May God bless your marriage and offer you a bright and shiny family! All my best wishes on your wedding. ♦ May the unique connection between you to stay unchanged eternally. Congratulations on your wedding! ♦ You are the most beautiful couple I’ve ever met. May your love grow stronger and stronger during your married life. Congratulations! 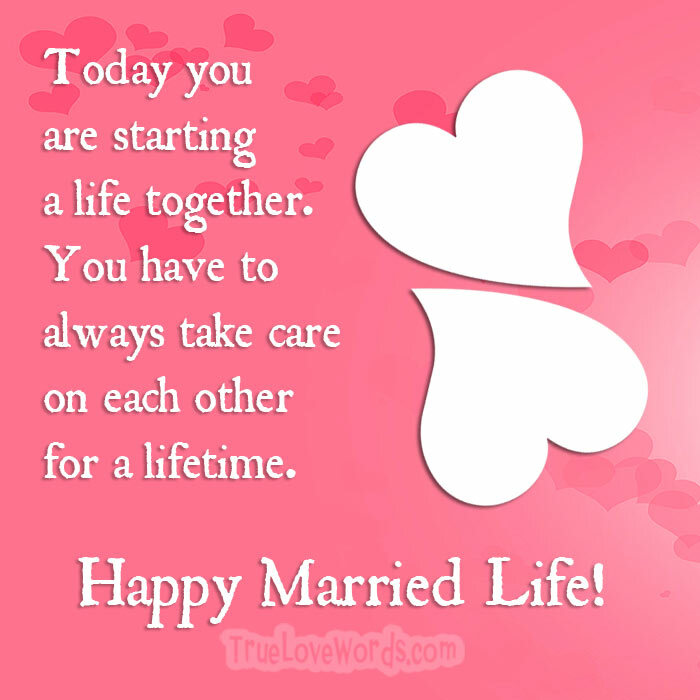 ♦ Today you are starting a life together. You have to always take care on each other for a lifetime. Congrats! ♦ This will be one of the happiest days of your common life. Remember though that hard time will come and you should be together strong to overpass all the obstacles you will face in the future. ♦ Take care of your family and make your home the safest place for your children. Congratulations on your wedding! ♦ May this day be the first of millions exciting and beautiful moments as a married couple. Congrats! ♦ You are the example of a real relationship. Wishing you always be this example for your surrounding people you love. My best wishes for this day. ♦ Wishing you to turn the meaning of your marriage into a fairy tale that we all tell to our children! Congrats! ♦ May your family be as great as your love is. Wishing you lot of joy on your wedding day. ♦ You are a unique example of how a loving couple should be. Congratulations on your wedding. ♦ Can you hear the bells ring? Can you feel the smell of love in the air? All my senses look forward for your wedding day! ♦ My warmest wedding wishes to the most stylish bride and groom. I’m so happy to see you getting married today. Congratulations on your wedding! ♦ May your married life be like the dance you will dance tonight! Wishing you the grooviest wedding ever made! ♦ There are many hard and happy times in married life, but true love has the power stay strong, unchanged and keep the family always together. All the best on your wedding day! 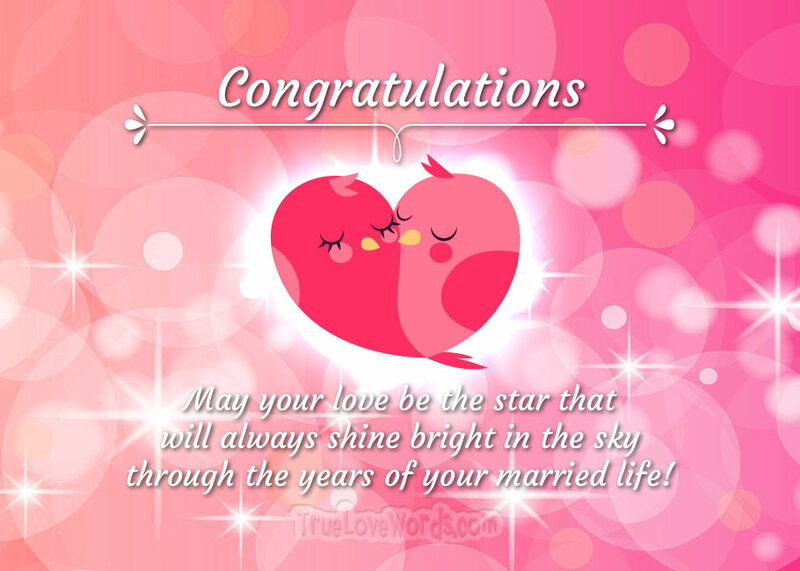 ♦ May your love be the star that will always shine bright in the sky through the years of your married life! ♦ Congratulations on your wedding! May you have a happy married life together! ♦ May your marriage be the beginning of a life full of joy, happiness and many cute babies! My warmest wedding wishes. ♦ There is nothing more beautiful than a bunch of children running around and destroying everything in the house! May you two have a lot of happy moments like this together. Congratulations on your wedding. ♦ You were always happy together and your wedding day was already too late. May you have a great and special married life together. ♦ This will be the most beautiful day of your life and the beginning of a unique and full of surprises journey. Enjoy it to the fullest. ♦ Wishing you a lifetime of love and joy. May your wedding day be the beginning of a bright future ahead. ♦ Congratulations to a couple who was always in my heart. I am so happy to see you start your own family! ♦ You are about to enter the next level of your relationship. It’s time to prepare yourselves for a noisy but joyful married life. Congratulations! ♦ Building a family you build a place of love, peace and tranquility that will keep you always safe. Congrats! ♦ We are very happy to call you both family. May God send you as many children as you wish, to fulfill your life with smiles and love! Enjoy your wedding day! ♦ Love and Hugs to both of you. This will be a memorable day, because you turn your love into a beautiful family. Congrats! ♦ We are so excited for your wedding day. We always wanted to see you as a bride and groom! Enjoy this day to the fullest! 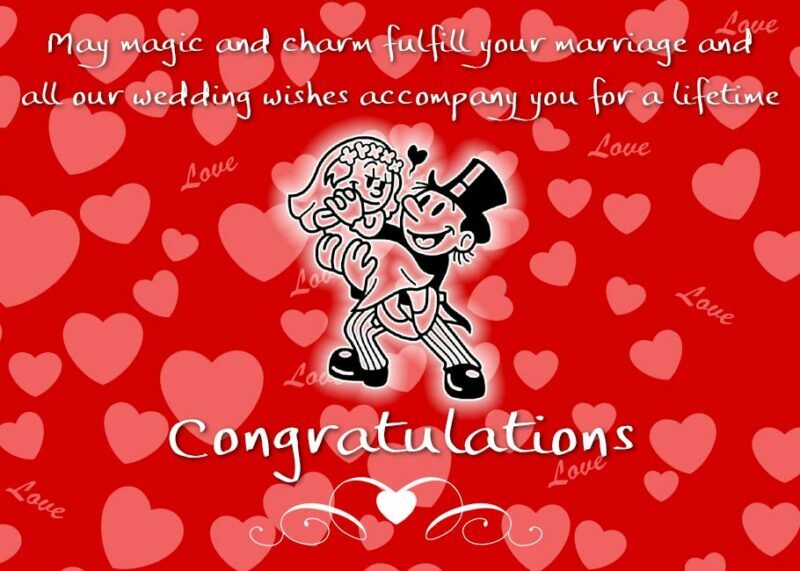 ♦ Our most sincere love and very best wedding wishes to you both! Love and happiness to all you future married life! ♦ May magic and charm fulfill your marriage and all our wedding wishes accompany you for a lifetime! ♦ The happiness of this day is one of the million that will follow and you both will experience together. Congratulations on your wedding. ♦ May you always be together as one and never split apart no matter the difficulties you may face in your future life. I love you both. ♦ Wishing you a dream family and an incredible journey of married life. Congrats on your wedding. ♦ Feeling your partner’s heart beating in your soul is what make a relationship last eternally. Love you both, congratulations. ♦ I read it in newspaper and tears of happiness filled my eyes. I am so proud of both of you. Happy married life together. ♦ May your marriage give you endless tenderness an unforgettable moments. Enjoy your wedding day! ♦ Don’t be afraid to get married. It’s an unstoppable roller coaster you cannot resist! Congratulations. ♦ Always take care of each other even if you are tired on the hard and difficult times in life. Joy and Happiness for your marriage.